Tamara and Jerry first reached out to us about photographing their elopement in Sequoia National Park this fall, and after getting that all planned and booked they opted to add on an adventure engagement session this spring! We were so excited, we love when our couples decide to do engagements with us because we get to know them so much better beforehand, and they get comfortable with our adventurous, candid photography style so by the time we’re photographing their elopement, they know exactly what to expect (and we do too!). They were pretty open to whatever we suggested, and wanted to work with our current travel schedule, and considering they live near San Diego we suggested Joshua Tree National Park. Tamara and I agreed it would be so cool for them to have photos in two California National Parks that honestly couldn’t be MORE different, despite both being centered around the epic trees they contain! We met up with them in Joshua Tree on a warm spring day and were lucky enough to pick a spot that felt all to ourselves despite the weekend crowds in the park. It was their first time, so we felt extra psyched to be showing them the epic and unusual park. We wandered around, through, and over Joshua Tree’s famous granite rocks, stood amazed at the wild looking trees, and finally were completely blown away by the amazing sunset! It was one of the best sunsets I’ve ever seen in the park (if not the best! ), and it seemed to last forever. By the time it was over we were all so tired and happy with the gorgeous light show feeling kind of like it was a dream. We loved getting to know these two and are now even more excited for their elopement in Sequoia National Park this fall! If you're on the fence about doing an adventure engagement session before your elopement, we hope this helps inspire you to go for it! Having some gorgeous photos in a different location, in more "normal" clothes, is such a special experience and is totally different than your elopement day! It's also a great way to get to know us and become familiar with our style. 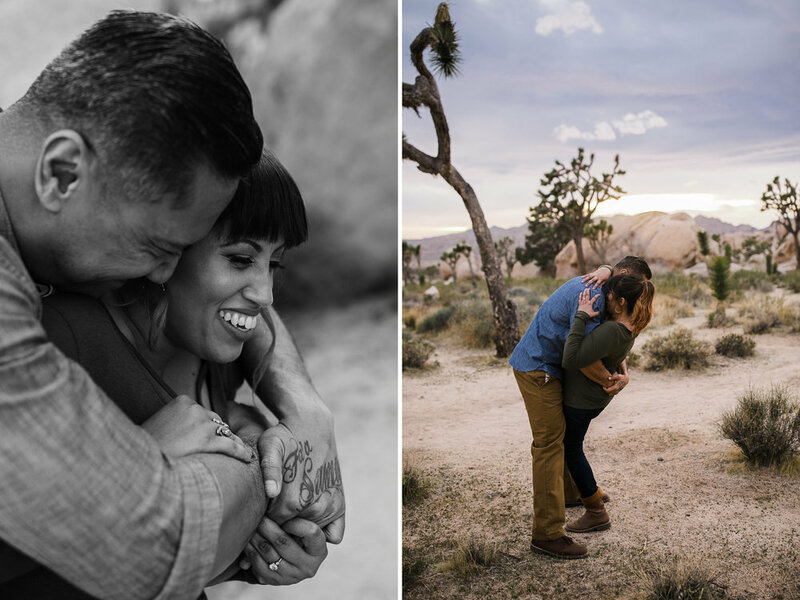 If you want more inspiration for adventure engagement sessions, you can check out this engagement session in Moab, Utah, this anniversary session in Patagonia, or this engagement session in Yosemite National Park.